So, I have had in the back of my mind that I should do a knitting blog post soon, but I hadn't fully realized how long it had been since I had written one. So long, in fact, that all these items now seem out of place because the seasons have changed... oops. 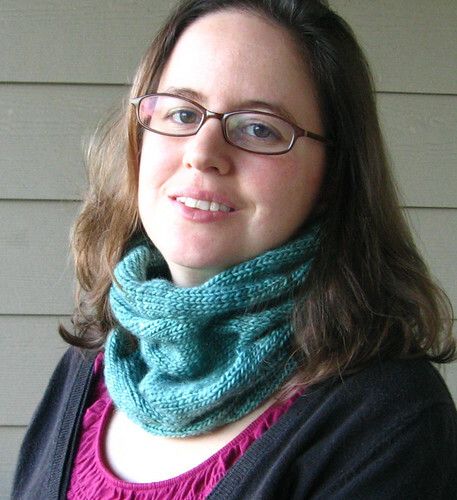 In my defense, it has only just started feeling warm here in Oregon and I actually just finished (and wore) one of the cowl (below) last week. 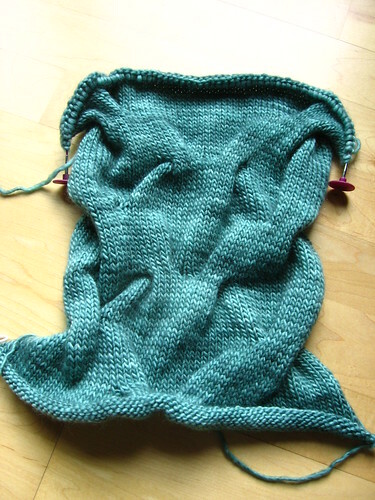 Anyways, this is kind of a roundup of the end of my winter knitting for the year. Since I didn't have many hats or scarves that I had knit for myself (and those that I did have ended up in storage when we moved), I went on a bit of a winter accessories knitting bonanza this year, helped on by a temporary obsession with cowls - as seen in previous posts this winter here, here, here, and here. Pretty much all the projects in this post came out of desire to think of a use for a fun yarn more than anything, and the winter accessories kick was a good fit with trying out new yarns without having to commit to a big project. 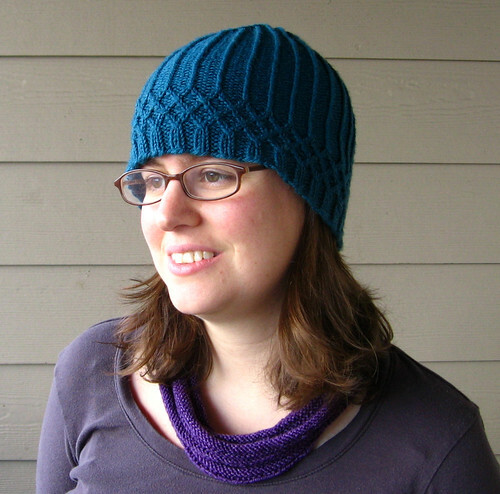 The hat above is the Claudia pattern, knit with 1 skein of superwash 220 that I bought exclusively because I loved the teal color. The hat is a bit snug and since it was warming up by the time I finished it, I didn't get much wear out if it this year, but I am hoping that it will break in well with more use next year. 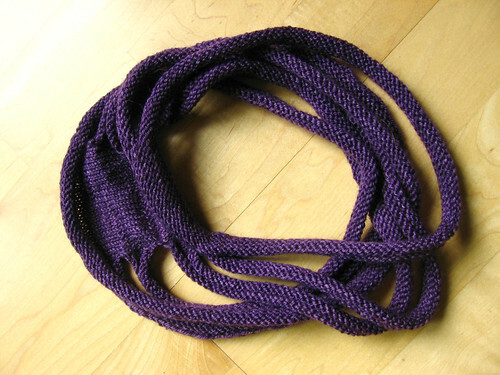 This necklace/cowl thing is made from the sevencircle pattern (although I ended up only making 6 circles), and was a great project for malabrigo sock yarn - which I had wanted to try but was hesitant to use for socks since it is 100% wool (no nylon) so it seemed like it would wear out quickly for socks. It is an interesting pattern, where you cast on a bunch of stitches, knit some rows, then cast off most of the stitches and cast back on a different number, repeat. You end up with loops attached by a small continuous section at the back that you can see in the photo above, and the back section mostly rolls up when you are wearing it and isn't too noticeable. Finally, I just finished this cowl, the tuesday night cowl pattern, which was a great match for super soft tosh merino yarn. I had heard folks online gush about tosh, but after having some serious pilling with other single ply yarns like malabrigo, I was hesitant to buy this expensive yarn for a big project. I love the depth of color in the yarn, so it will be good to see how well it wears - if nothing else, I would definitely use it for more hats/scarves/cowls in the future, if not for a sweater (not that I have really been knitting adult-sized sweaters lately anyways). This pattern was really fun, with a series of really big cables that give it a neat folded texture when you are wearing it. The construction was cool too - you do a provisional cast on and then knit back and forth like you were making a scarf, and then at the end you do a grafting stitch to join the two sets of live stitches and make an invisible join to form the loop. I tried a new provisional cast-on technique which was so much easier than the chained cast-on I have done in the past. It was especially great because I was using my knitpicks interchangeable needles - since you end up with the new stitches held on a needle, I just took off the needle tips and put on the needle end caps while I was knitting making a convenient stitch holder. Then at the end when I was ready to graft I just put a needle tip back on one end and I was ready to start the kitchener stitch. (Apologies for all the lingo for any non-knitters reading this). In other news, we are moving on Friday, so the next time I post may be from the new house (fingers crossed we will have internet there soon). I'll try to take some photos of the house to share here!